The world is black and white, as basic as that. All you see is a black directional arrow on a white background. With a point-and-click you try to get a bearing on your surroundings... but there's naught else to see. Are you too focused on that one scene in front of you to make sense of what you're meant to do next? Well, there is more here than first meets the eye. Of course there is. If there's nothing else you can expect from a Robamimi escape game, it's that you can expect surprises. So play around a bit more, "make full use of the mouse," and as you do, more ways to explore will open up to you. That is what One Scene 7 is all about. Solve the sneakily simple puzzles in order to find, and open, the door to escape. Then do it again to have both endings, because life is really more colorful than you know. Robamimi escapes continue to please because, besides being reliably high quality and aesthetically appealing, the designer's enthusiastic creativity. Not only are we invited to experiment with the elements on screen, it's so obvious by the inventive touches and fresh approaches to the genre that Robamimi loves to play with new ways to make her games entertaining. This simpatico between author and player let's us feel as if invited to an escape game party being held in some really cool digs. If you've been through the gamut of Robamimi's oeuvre—including Smile For Me, Fake, and Neighbor—you're well versed in the designer's versatility, but even amongst the One Scene series is a remarkable variety. The talent is no less apparent here. The puzzles themselves rely less on logical thought, having little to do with deciphering abstract riddles or calculating codes, you do need to put your brain to work in inferring what each clue is telling you to do. So telling you too much about how to play would spoil it. Just know you should feel free to experiment and let not only yourself, but the device you're playing on, be immersed into this single scene environment. Because messing with the conventions and breaking the established "rules" needs doing now and then. One Scene 7 Walkthrough now available! 12. Pick up "part of some kind"
There are two endings. After finishing there is a button to commence playing at step 21, though you might have to redo step 18. I turned on the color. The little shelf is on its side and I see the colors, but can't figure out what this refers to. I click where I can, but nothing happens. Nudge, please? POP. Just saw a clue that I missed before. Out. 2 endings, got both endings :) Not bad, if a little short. I've found what look like the doors to both endings, but I can't seem to find the key for either. Can someone help me out? I clicked the play button and something tried to install a video player on my system. My antivirus managed to block it. Don't know if it was malware or anything to do with JIG or robamami.biz but thought I'd mention it. it's not actually a key you're looking for...more like a doorknob, or at least something that could pass for one in a pinch. Did anyone else have trouble with #14 "To open the door: frequently move your mouse up and down over it"... awkward! This is one of those escape rooms that I could almost imagine someone trying to build in the real world. It would certainly be amusing. Except, they'd probably choose an alternative to making people punch holes in the place...maintenance costs and all. Was pretty short, but I really liked the clean look and the creativity behind it. Was a tiny bit confused on the opening screen and then once I figured out how to get started a way I went. Will have to check out the second ending now. Nice! I like the One Scene games anyway but this one had a little element of Grow AND had 2 endings - something they don't usually have, to my knowledge. Really fun, with some novel twists. I always look forward to a new Robamimi game and this one didn't disappoint...except that it was short. put the leg behind the fallen cupboard? 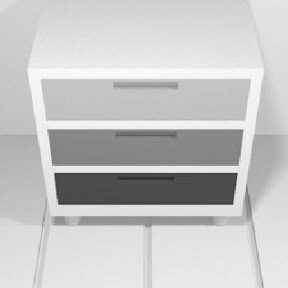 I can't get the fallen cupboard (chest of drawers?) to move. You won't actually need to move the cupboard. Provided that you've done the right-click thing successfully (step 18 of the walkthrough), a door should appear behind the cupboard and to the left, with a visible hole for the leg. supposedly i'm to look behind the cupboard or movie it or whatever it says but there's nothing to move or go behind. what do I do? Nice one Robamimi! Clever, logical, with a new twist on things. Nothing to make you bang your head against a wall, but did make you put two and two together. Perfect way to raise the bar. Something about your mouse maybe? as it is a flash game if I click right on my mouse I get flash info and what not, so how would mouse R mean right click? If you're getting the Flash info, try giving it a closer inspection. Robamimi never disappoints, and this little escape is no exception! Even with just one view, it is an innovative escape that excels in all aspects, except that you just don't want it to end so soon! But, the point of the One Scene escapes is not drawn-out complexity, but simple and direct puzzle solving; Robamimi's fantastic full-length escapes are chock full of completely intertwined puzzles that I can't solve without taking notes or screen shots to keep track of all the clues as I go. Overall, a very nice twist on the One Scene series! I love the Oriental piano in the background. Just gives it an extra kick! Just played...what a super game...haven't seen such a creative one in a LONG time!